All there is to know is that you are in the Philippines. Yet, the country is not supposed to be this way! It should be filled with the hustle and bustle of the city! There should be business! There should be traffic! But Technology is nowhere to be seen! Instead you are situated in the center of Eden: calm and in perfect balance with your yin and yang. You are witnessing nature at its finest. You feel all your inhibitions slowly slipping. You tried to take in your lungs the salty scent of the nearby sea. Why, you have never seen a sea so cerulean like the eyes of a god staring right into your soul. Pinching yourself, you now doubt, are you still alive? You peered at the depths of the ocean…you see the beginning of life in the form of fishes. Yes. Fishes varying in color—teasing your senses, playing with your fancy. You see corals: a textured rainbow in the deep blue. Your trance cannot end. You still need to taste whatever ambrosia this place has to offer. 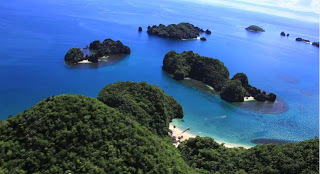 Caramoan is just one part among the 7,107 islands that make up the Philippines. Its white sand is just one among the millions surrounding the country. You feel you have seen everything presented to you by the heavens above. You forget the life you left behind. You are at peace. You do not know how long you will be staying here. You do not know, as well, if you shall be salvaged. The only thing you know is that if this is a nightmare, it is one you wish to stay in eternally. Caramoan. Felicity. Ecstasy. Nirvana. Will you still strive to leave and abandon this dream? This entry was posted in Travel and tagged Caramoan, Caramoan Island, corals, exotic island, fish, ocean, Philippines, virgin paradise on March 3, 2013 by Nikki Babie.